Here is a view of PYY 28D. 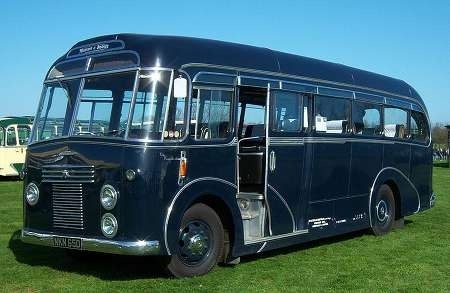 She is a Bedford J2SZ2, built for use as a Staff Bus for the Royal Household. The bodywork is a Duple Midland C10F. She started life with registration KLP 1D with the Royal Household and is seen at the National Tramway Museum, Crich, on 30 August 2004. The livery appears to be black. but it is really an incredibly dark and highly-polished green. Incredible, Pete. I’d forgotten all about this beast – but cannot remember where I saw it last. A fine vehicle indeed, and one that I’ve never heard of before. Presumably the impeccable dark green livery means it was supplied by Harrods "by appointment to H. M. The Queen, suppliers of motor omnibuses" – sorry, just another of my infantile mischievous thoughts !! Nice one Chris – but don’t mock. You never know. I believe that ‘purveyors’ is the word, rather than ‘suppliers’, Chris! Much more classy! What is the current situation of the vehicle? Many ‘royal’ vehicles/trains/yachts have very cossetted and long lives – is this one of them? It’s a very stylish vehicle which hasn’t really dated. This is a very nice looking coach – reminds me of the Maidstone & District Knightrider in it’s livery style (although the M&D one was really black, I think). But is it cheeky to ponder why the Royal Household chose a Bedford coach? Why not go to their supplier of limousines, Daimler? A few years earlier, and they could have had that rarity, a Daimler Freeline. But in 1966, I suppose they would have had a Roadliner supplied to them – perhaps they had already heard of it’s reputation! There was also a Bedford VAS3 with a Willowbrook DP20F body new in 1972. This vehicle had an outward opening door. It was often seen at Aberdeen railway station taken staff and luggage to and from Balmoral. This vehicle is now preserved as RBY 764 K.
The Monarch’s current ride is a Bentley. The prior ride was a Rolls Royce. 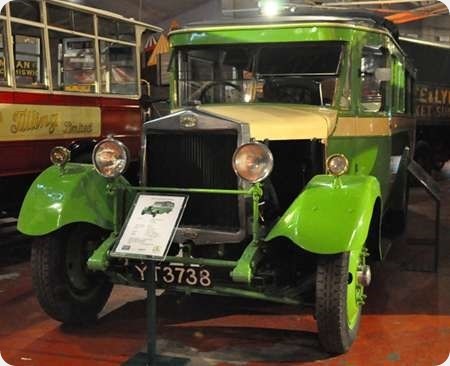 Before that, they used Daimler cars – but pre-war it was Crossley cars…..
She appears in the PSVC listing for 2012. That’s where I obtained the detail of her previous registration. Has anyone heard any rumblings about when the next issue may be out? Think yourselves lucky, folks, as you nearly got a jet fighter after I hit the wrong button. Peter spotted the mistake before I did! By chance, Chris Youhill is nearly right because the Queen does use Harrods for her transport requirements. 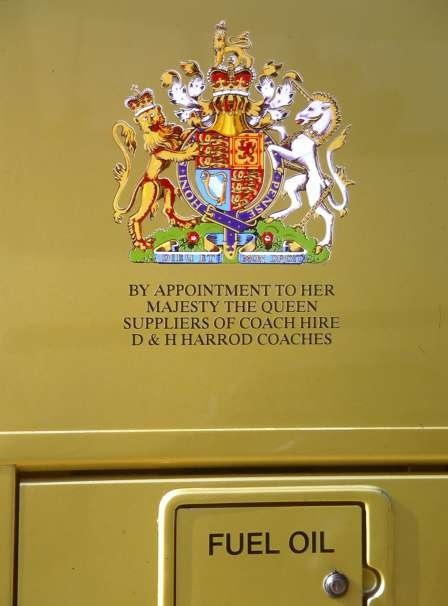 In this instance, it is D & H Harrod Coaches of Downham Market, Norfolk who are "By appointment to her Majesty the Queen, Suppliers of Coach Hire"
I’m sure this is the one that was at the Kirkby Stephen Easter rally this year. I’ve seen it a couple of times at recent rallies. 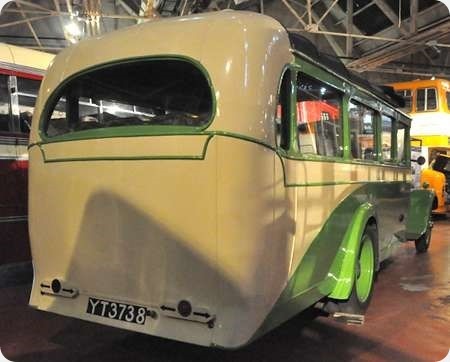 I believe it has recently been advertised for sale in Bus and Coach Preservation magazine. Very good, Nigel. For the benefit of those including me who have always thought it was HARROLD, here’s a view of the Warrant. It is indeed HARROD. I can’t let the comment about Maidstone & District’s Knightrider coach go uncorrected. It was indeed a dark refined colour, quite different from the fleet colours. Although it might look black in black & white photographs – and some colour renditions, too – it was in fact dark blue. Thank you Petras for your correction re the livery of M&D’s Knightrider coach. It makes the comparison with the Royal Household coach more pertinent, as both could appear black to a casual observer, but are actually very refined liveries in their respective colours. Petras409 makes reference to the Maidstone and District Knightrider livery of dark blue. I have recently acquired a M&D cap badge which is dark blue and not the usual Green. I was informed that it was for staff working on the Knightrider, can anybody confirm this? Coaches belonging to Charles Rickards of London (later Frames Rickards) carried the Royal Warrant for many years. I imagine that there will be other operators, in addition to Harrod’s, with a Royal Warrant. Downham Market seems nicely placed for Sandringham. PYY 28D has now reverted to KLP 1D and was seen at The Llandudno Transport Festival in May with these plates, and a check on DVLA web site confirms this. It would seem that the Knightrider was named after M&D’s head office, based in Knightrider House, Knightrider Street. Was this coach designed for special work or what? It was kept in a state of permanent readiness at Sittingbourne depot, in fine fettle, but clocked up a very low mileage. The picture from the web (Commons copyright free) shows its midnight blue livery well. NKN 650 survives in restoration and must have involved very little restorative work by its current owners, after its undemanding life with M&D. I was privileged to have a ride in it, on the occasion of a colleague’s retirement bash, while still with M&D. It provided such a quiet, refined ride. Possibly the most luxurious coach ride of my life – the only thing that was missing was the gin & tonic from the cocktail cabinet. This last comment is a lifestyle point, not a definitive statement about the presence (or absence) of such a fitment. Thx, Petras409 for the fulsome explanation and additional photo. In those days, a petrol engine still had the cache of seeming luxurious over a diesel. Did it have a Bedford engine, Petras? Interesting comment from Petras about "Knightrider" in respect of the drinks cabinet. Grossly off topic, I know, but readers might find this amusing. I was using my ‘old dodders’ bus pass’ a few months ago, and was in Southsea, returning to Southampton. A lady in a wheelchair boarded, and commented on how old the bus was (S prefix, 1998). "Where’s the wide screen television?" she asked. "And the drinks machine?" The driver replied that he’d been naughty, and had been given this one by way of punishment (I suppose it’s better than a school run!) A few minutes later the lady had managed to fit the wheelchair into the space, and apologised thus: "Sorry about the delay in settling, folks, but my wheelchair’s put on a few extra inches since Christmas!" Why did M&D feel the need to have a dedicated Directors coach (Salford’s Committee coach comes to mind here)? I suppose at Salford there wouldn’t have been any other "suitable" [sic] vehicle for the Transport Committee to travel in, but surely M&D had enough front-line coaches to put one at the disposal of the Directors – neighbours Southdown and East Kent (companies with a similar commitment to coaching, and others such as BMMO and Ribble) didn’t feel the need for this extravagance . . . or was that the point, keeping ahead of the Jones’s? 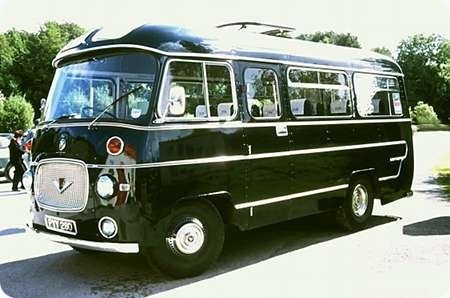 For Chris Hebbron’s information the Commer Avenger petrol engine was a six cylinder OHV Humber unit as also used in the Imperial Limousine and in the Commer QX lorry. For the Avenger and the QX it was mounted at an angle of 60 degrees to reduce intrusion into the cab. 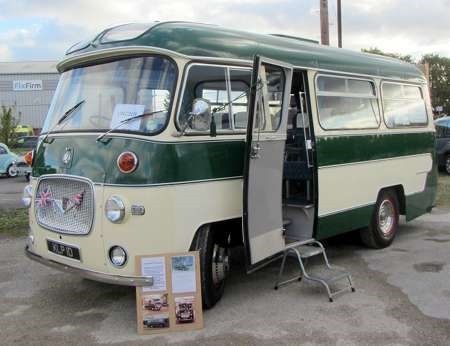 Just to revert back to this post, I am trying to trace a subsequent Bedford that also carried the KLP 1D mark. This was a 1985 Bedford PJK chassis No FT103932 with a cut down Duple Dominant 2 body C16F No 8507/0600 new to Kensington Palace in 6/85. 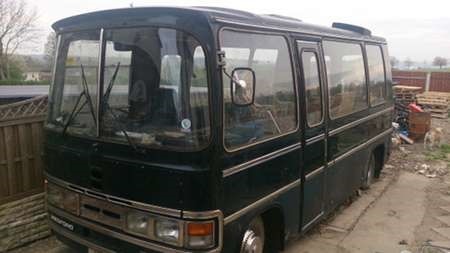 This appeared on eBay in July 2014 with seats removed after an aborted attempt to turn it into a caravan. It was sold to a number plate dealer who sold off the KLP 1D mark to the owner of the J2 (PYY 28D) which is now re united with its original mark. The PJK was reported to have been sold on with another (unknown) registration number to a school or charity organisation possibly for a greenhouse! I am trying to trace this vehicle so if anyone spots it or knows where it is I would like to know through this website. The pic shows it in 2014 when it appeared on eBay. On 5th Nov, I was at the Lincoln Vintage Vehicle Society running event, and noticed this little charmer parked up among the other smaller exhibits. I thought, I have seen this somewhere before, and yes, it is there in the OBP site in some earlier guise. It carried various window displays about its illustrious history and the front window card stated "Lincoln via Aidensfield" which suggests where it had been in the recent past. The Duple Dominant Royal coach has been found at Sutton House & Breakers Yard a National Trust property at 2-4 Homerton High Street, Hackney, London. Its been made into a greenhouse with the chassis and floor cut away to give ground level access. If you are on a site which doesn’t readily accept right click Copy & Paste. You can usually use Ctrl C for copy and Ctrl V for paste.